Were Terence Rattigan alive now he would be amazed at the renewed interest and popularity of his work. How fashions do change. 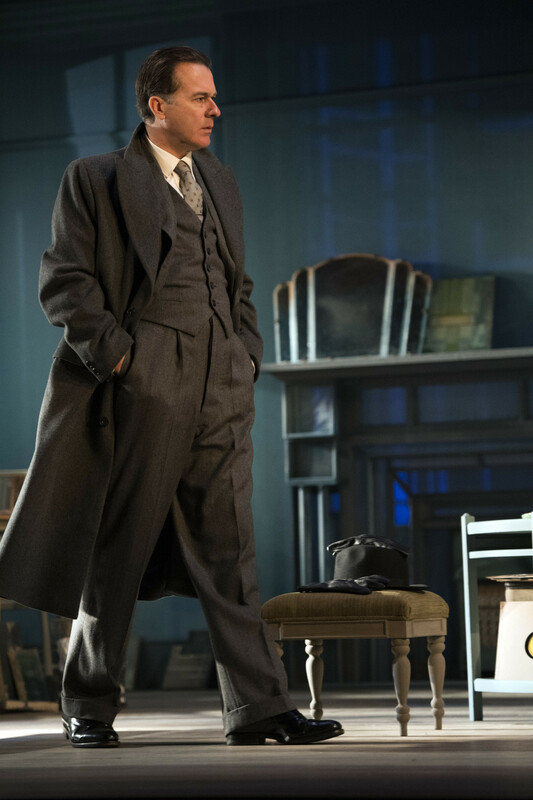 And how he might have been amused to have not just The Deep Blue Sea running at the National but also Mike Poulton’s doppelganger, Kenny Morgan, recently at the Arcola. Poulton’s fictionalised account of Rattigan’s affair with and the suicide of the young actor returns the story to its true gay, male roots. Rattigan, writing within the criminal codes of his time, of course transformed Kenny into the female Hester with himself recast as Hester’s estranged husband, the Judge whilst the object of Kenny’s unrequited love became Freddie Page, ex Spitfire fighter turned test pilot. The wonder of Lucy Bailey’s production at the Arcola was its intense evocation of Rattigan’s postwar world and the importance of the peripheral characters. At the National, Carrick Cracknell’s grander revival, echoing the atmosphere of her Young Vic revival of A Doll’s House, once again gives a vivid sense of movement and multiple lives courtesy of Tom Scutt’s multi-storied design with boarders scurrying up and down stairs whilst Hester’s personal tragedy plays out in front of us. 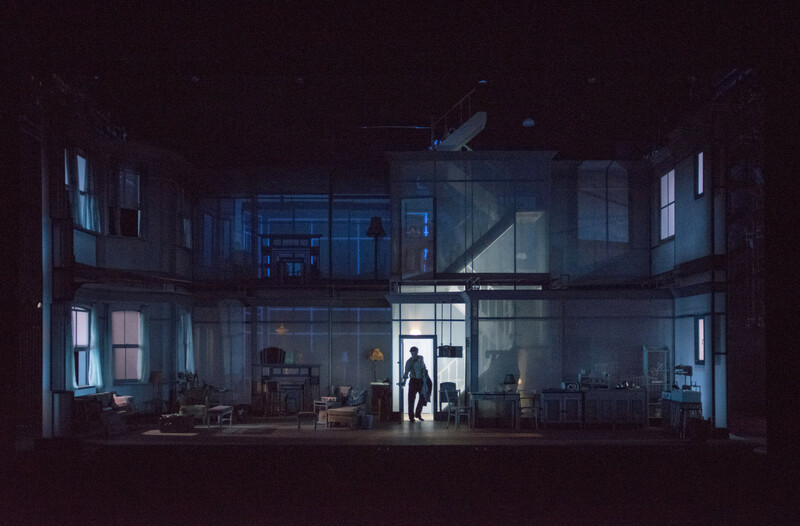 In fact, Cracknell’s production goes further in aligning Deep Blue Sea with Doll’s House by rendering Hester even more emphatically a latter day, 1950s Nora. In Helen McCrory’s characteristically highly charged performance, all the despair of Hester’s unrequited love for Tom Burke’s restless, demobbed Freddie, is brought sharply into focus. But so too her drive to become her own woman, in her painting and her decision to leave the comfort but emotionally dead marriage with Peter Sullivan’s extraordinarily violent Judge. If ever there was a picture of repressed passion, it is this production’s Judge. © Richard Hubert Smith, Peter Sullivan as Sir William Collyer, the Judge, Hester’s husband. McCrory too makes wonderfully clear Rattigan’s attention to the proprieties of a British middle class upbringing whilst gradually hinting, despite her desperation, at her survival instinct. Nothing surprises more after she bids farewell to Freddie than her final gesture – biting into a fried egg sandwich. Unlike some recent revivals, Cracknell’s interpretation is unequivocal. Hester will live! A strong cast supports elsewhere, but it’s McCrory’s night! 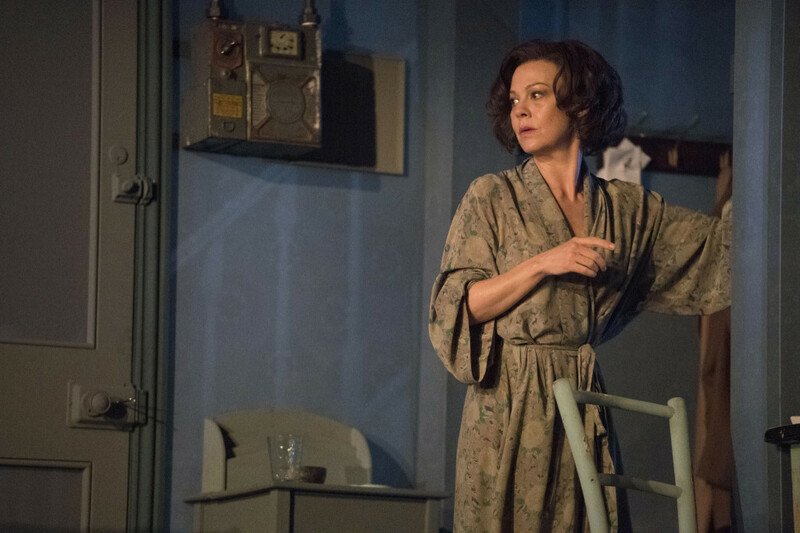 This entry was posted in 2016, Reviews and tagged Britain post war period, Carrie Cracknell, Helen McCrory, National Theatre, Peter Sullivan, Terence Rattigan, Tom Burke, Tom Scutt, unrequited love on July 5, 2016 by Carole Woddis.